Are New Ecommerce Strategies Hurting UPS and FedEx? 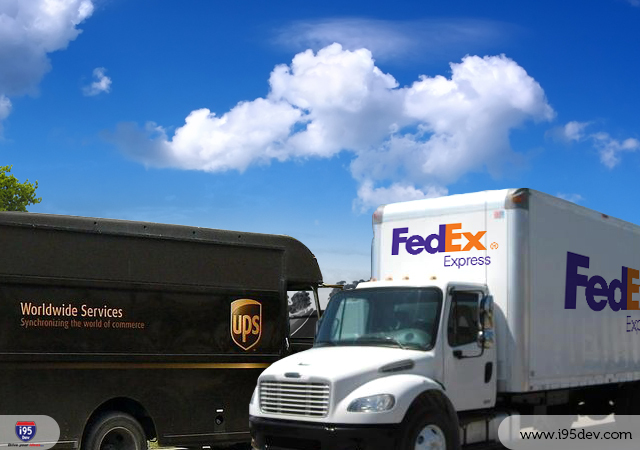 UPS and FedEx used to only have to worry about battling each other for more business. For years, they have dominated the ecommerce world, pulling in large amounts of revenue from ecommerce strategies. Unfortunately, this is no longer the case. While most people think this is due to the slow economies around the world, the change is actually due to changing ecommerce strategies. UPS, FedEx and other major shipping companies need to take note and make appropriate changes. Retailers, both online and in brick and mortar stores, are using new ways to cut shipping costs and keep shipments local. For instance, Amazon.com is building distribution centers located throughout the United States to cut back on shipping times and costs. They have also purchased their own fleet of trucks to handle some of the deliveries without relying on companies like UPS and FedEx. Wal-Mart, Best Buy, Gap and other similar retailers aren’t using distribution centers or warehouses. Instead, they often ship orders from store locations that are close to the consumer, reducing shipping costs and shipping times. In addition to saving on shipping, this method of shipping ecommerce orders also saves money on leasing warehouses. Even though the distribution centers belong to larger retailers, these centers may allow small businesses to take advantage. They may be able to lease some of the space within these distribution centers and can even use their logistics to deliver orders. This can save small businesses a lot of money over entrusting this task to typical third-party logistics companies, including UPS and FedEx. This also provides benefits to the larger retailers, providing them with an additional source of income without more work. How Does This Impact UPS and FedEx? If this ecommerce trend continues, it will have a drastic impact on the business models of UPS and FedEx, as well as other major shipping companies. These strategies are already under development by many of the major retailers throughout the United States. However, these ecommerce strategies will take a while to fully implement. This leaves UPS and FedEx with time to develop new strategies that will save them from losing too much money. What do you think shippers like UPS and FedEx can do to reduce the risks the changing ecommerce trends pose? Post your ideas in the comments below.